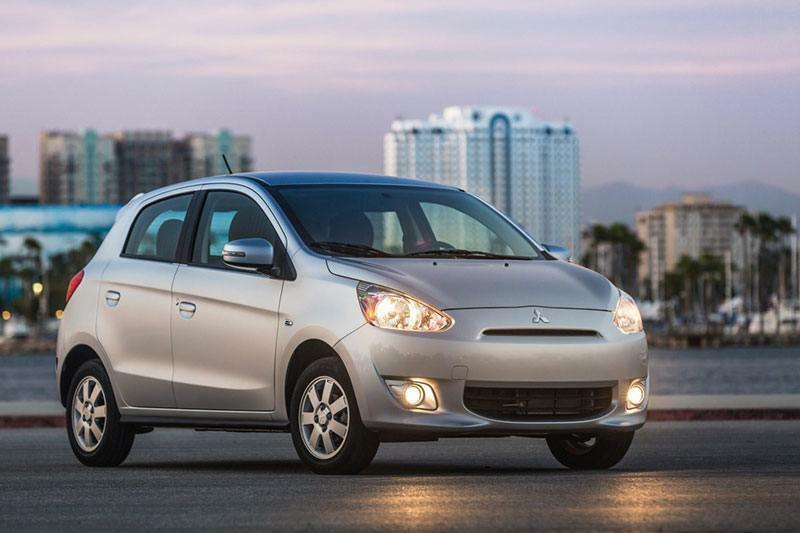 The Mitsubishi Mirage sees a handful of minor upgrades. Both trims now have a shorter radio antenna and added chrome interior accents, while the ES trim now features mirror-mounted turn signal repeaters and new upholstery. The subcompact economy car segment, once comprising mostly rolling penalty boxes, has matured into one with a number of pleasant, inexpensive transportation choices. Sadly, the 2015 Mitsubishi Mirage, despite being one of the newest entries here, seems to be a holdout. You won’t immediately notice this just by looking at the specs. With an EPA-estimated 40 mpg when combined with the available continuously variable transmission (CVT) and an impressively low base price, this four-door Mitsubishihatchback is certainly thrifty. Standard features on the base model are pretty good and even include automatic climate control and a USB/iPod hookup for the audio system, while the options roster includes a navigation system, a rearview camera and front and rear parking sensors. Adding more window sticker conviction is the generous warranty coverage. Head out on a test-drive, however, and the bloom comes off the rose, quickly. Underway, you can’t help but notice the wheezy acceleration, bumpy ride and unsettled handling. Furthermore, the cabin environment isn’t especially pleasant. There’s a lot of engine noise no matter how fast you’re going, and most of the interior materials are low in quality even for this fairly thrifty segment. For these reasons, we’ve given the Mirage an Edmunds «D» rating and strongly encourage shoppers to consider other choices in this price range. If affordability is top priority, the Chevy Spark actually has a lower starting price. It’s also a more enjoyable car to drive, and its interior doesn’t feel cheap. If you can spend a bit more, you’ll find that cars like the2015 Ford Fiesta, 2015 Honda Fit and Hyundai Accent offer quite a bit more room inside, better ride qualities and quicker acceleration. Sometimes retro has its appeal, but that’s not the case with the 2015 Mirage. 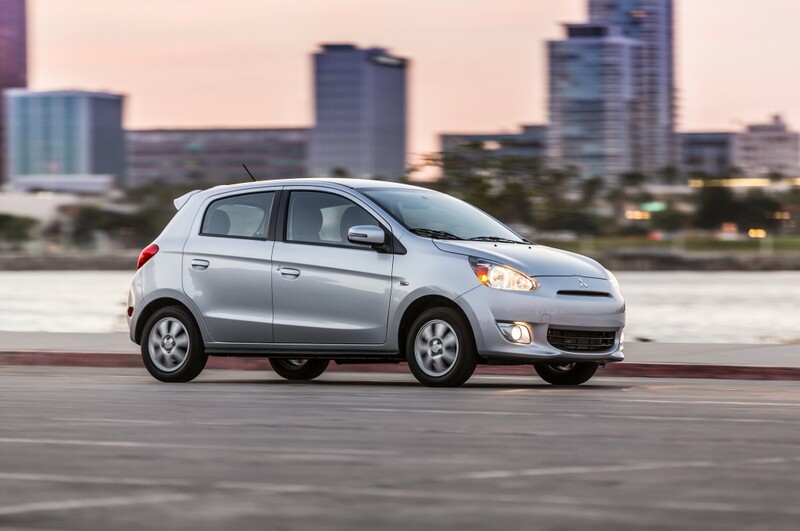 The 2015 Mitsubishi Mirage is a small, four-door, five-passenger hatchback offered in two trim levels: DE and ES. Standard features for the base DE trim include 14-inch steel wheels, a rear spoiler, keyless entry, full power accessories, automatic climate control, a tilt-only steering wheel, 60/40-split-folding rear seats and a four-speaker sound system with a CD player and USB and auxiliary audio inputs. Alloy wheels are a stand-alone option on the DE. 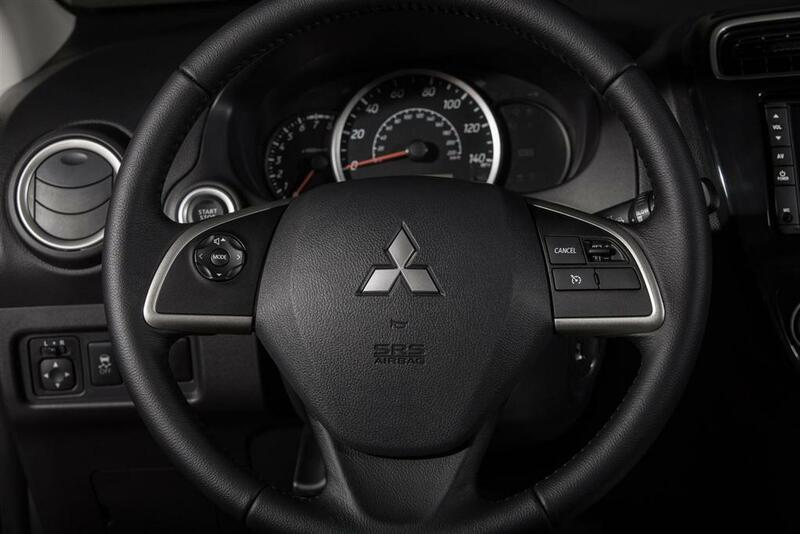 The ES adds those 14-inch alloys, along with keyless ignition and entry, foglights, cruise control, a height-adjustable driver seat, a leather-wrapped steering wheel (with audio controls) and shift knob, Bluetooth phone connectivity and metallic interior accents. The optional Navigation package adds a navigation system (imagine that!) and a rearview camera. Available on both the DE and ES trims, the Park Assist package adds front and rear parking sensors. Other options include various chrome exterior accents, added interior lighting and utility items like cargo nets and mud flaps. Powering the front-wheel-drive 2015 Mitsubishi Mirage is a 1.2-liter three-cylinder engine that produces 74 horsepower and 74 pound-feet of torque. Both trim levels give you the choice of a five-speed manual transmission or a CVT. The EPA’s estimated fuel economy for the Mirage with the five-speed manual is 37 mpg combined (34 city/42 highway). With the CVT, the estimates are even higher at 40 mpg combined (37/44), which is impressive for a non-hybrid vehicle. In Edmunds performance testing, a Mirage with the CVT went from zero to 60 mph in 11.7 seconds, a slow time even for a subcompact car. Standard safety features for the 2015 Mitsubishi Mirage include four-wheel antilock brakes (front discs, rear drums), front-seat side airbags, side curtain airbags, a driver knee airbag, and traction and stability control. Front and rear parking sensors are optional on both trim levels, while a rearview camera is optional only on the ES. In Edmunds brake testing, the 2015 Mitsubishi Mirage came to a stop from 60 mph in 121 feet, an average distance for a car in this class. In crash testing by the Insurance Institute for Highway Safety, the Mirage received the highest possible rating of «Good» in the moderate-overlap frontal-offset, side-impact and roof strength tests. The Mirage’s seat/head restraint design was also rated «Good» for whiplash protection in rear impacts. In that agency’s small-overlap frontal-offset test, however, the Mirage received the lowest score of «Poor.» In government testing, the Mirage earned four-of-five possible stars for overall crash worthiness, with five stars in side-impact and four stars for rollover potential. 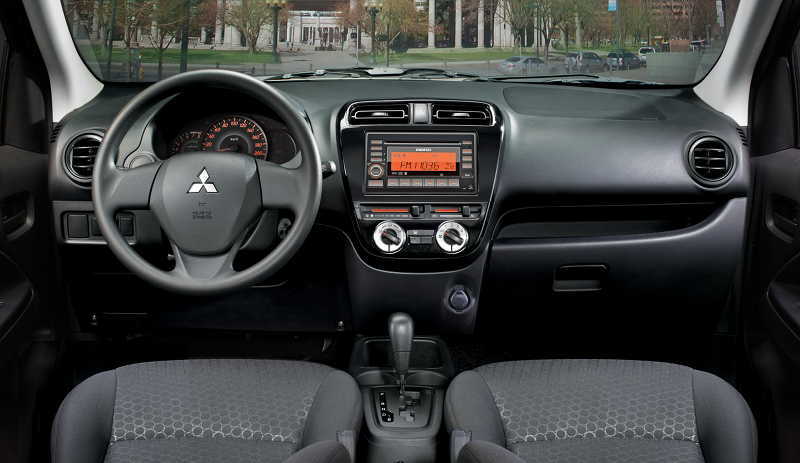 Don’t expect anything fancy inside the 2015 Mitsubishi Mirage. Most surfaces are hard plastic and not particularly high in quality. On a positive note, all the essential controls are easily accessible and simple to use. The lack of a telescoping steering wheel might make it a little difficult for some drivers to get comfortable behind the wheel, but taller folks should find enough head- and legroom. On longer drives, the hard door armrests and the lack of a front center armrest reduce driver comfort. In the rear, headroom and shoulder room are limited, and average-size adults will likely find the quarters cramped. In addition, the rear bench is quite flat, with minimal cushioning. With the rear seats in place, the Mirage offers a respectable 17.2 cubic feet of cargo space. With the seats folded down, capacity increases to 47 cubic feet: a good number for this class. Thanks to a small turning circle and light-effort steering, the 2015 Mitsubishi Mirage is easy to maneuver in dense urban settings. On the highway, though, the little car becomes fidgety and demands more of the driver’s attention. The Mirage rides harshly over bumpy pavement, and handling isn’t what we’d call confident or secure. Rival subcompact cars far surpass the Mitsubishi in these areas. Although the three-cylinder engine is certainly fuel-efficient, acceleration is quite slow and you’ll need to plan well ahead for passing maneuvers on the highway. Even more annoying than the sluggish performance is the excessive noise from the engine compartment. Even at low speeds, the three-cylinder makes a considerable racket. The CVT often adds to the mayhem, as the slightest increase in accelerator pedal pressure results in a dramatic increase in engine rpm.